You have a narrow window of time to select and purchase your health insurance for 2018 (Nov 1st to Dec 15th 2017.) This is an important decision since most people will have to wait until the following year to change plans. It pays to do your homework ahead of time and learn as much as you can about your options. We can help you make sense of the many options; as well as how best to estimate your income which is the basis for your net cost. For insurance to start, your first payment must be received by the insurance company prior to the policy start date. For example, if you enroll between Nov 1st and Dec 15th, your payment must be received by Dec 27th to ensure that your insurance starts on Jan 1st. If your payment isn’t received by the deadline, your application will expire and you will have to reapply. If you missed the 2017 Annual Open Enrollment Period (Nov 1st 2016 to Jan 31st 2017), you must have a “qualifying life event” in order to qualify for a special enrollment period and be able to reapply. As a Western North Carolina resident, Blue Cross Blue Shield of NC offers six possible plan choices for your affordable care act insurance. If you qualify for additional cost sharing reductions, be sure to review the Silver plan choices for added savings. Your local navigator can help you understand the differences and how each matches with your personal needs. For those of you who may have had insurance through UnitedHealthCare or Aetna/Coventry in 2016, we can help you with enrolling in BlueCrossBlueShieldNC for 2017. We encourage you to actively re-enroll and review your plan choices prior to Dec 15th. You may be eligible for financial help to pay for your healthcare insurance purchased through the federal marketplace. There are two types of assistance – Advance Premium Tax Credits and Cost Sharing Reductions. Make an appointment with your local navigator to find out what your net cost for insurance will be after these are applied. There’s no one right choice for everyone. Your local navigator can help you narrow down your choices based on your needs and ability to pay. Get the right plan for the right price. Find out what types of plans are offered in your area. Get the low down on financial assistance with Advance Premium Tax Credits. Discover additional financial help that is often overlooked. And when you meet with your Certified Navigator, learn how to compare the costs of each policy you’re considering as it relates to your expected (and unexpected) medical needs. See What You Should Know About Provider Networks to get a better understanding of the differences between PPO, POS and HMO plan types. Some plans have broader provider networks than others. Always check to see if the doctors, specialists, or hospitals you want to use are included “in network” when selecting a plan. To do this check both the insurance company’s provider listing as well as checking with the doctor’s office since changes may occur. Out of network care isn’t always available, and is something to consider if you travel a lot, work a good distance from where you live, or just want the freedom to choose your own doctor. If you choose a plan that doesn’t offer out of network coverage, and you see a doctor or use a medical service that isn’t in their network, you may have to pay the full cost of the services you get. Even if a plan offers out of network coverage, you may need a referral to the out of network provider, pay higher fees and/or have an additional out-of-network deductible and higher out-of-pocket costs. However no matter what type of plan you choose, generally health plans cannot require higher copayments or coinsurance if you get emergency care from an out of network hospital. But they can bill you for some additional costs or for extended stays beyond the immediate emergency. Some plans require you to choose (or be assigned) a Primary Care Physician (PCP) and use that doctor as your gateway to other physicians, specialists and services. Others allow you to make your own appointments without referrals from a primary care physician. Remember that your local navigator is available to help you compare different plan offerings and how they might match your personal needs. Make an appointment today for help. If your tax return household modified adjusted gross income (MAGI) is between 100% and 400% of the federal poverty levels, you are eligible for subsidies (paid directly to the insurance companies) that lower your net cost for insurance. These “subsidies” are paid in the form of a premium tax credit and the final amount you are entitled to is figured after the end of the year as part of filing your tax return. In your enrollment application you are asked to estimate what your income will be for the coming year; and are given the option to take monthly advances (paid directly to your insurance company) against your estimated year end premium tax credit. In addition to the premium tax credits, you may also be eligible for “cost-sharing reductions.” The cost sharing reductions are reflected in lower deductibles, lower maximum out of pocket costs, lower copays, and lower coinsurance. However these additional savings are only available if you choose a plan in the Silver category. So always compare Silver plans to the other categories if your eligibility results say you’re also eligible for cost-sharing reductions. Your modified adjusted gross income (MAGI) must be between 100% and 250% of the federal poverty levels to receive this extra financial support. The closer your income is to the 100%, the greater the savings. There are 3 levels of support related to cost sharing reductions, which are reflected in the colored lines on the chart below. Choosing your health insurance plan is an important decision, and is potentially the most confusing part of enrollment. Remember that your local healthcare navigator is available to help you make comparisons and apply them to your personal situation. Make an appointment today to get in-person assistance! There are 4 “metal” categories of plans: Bronze, Silver, Gold and Platinum. 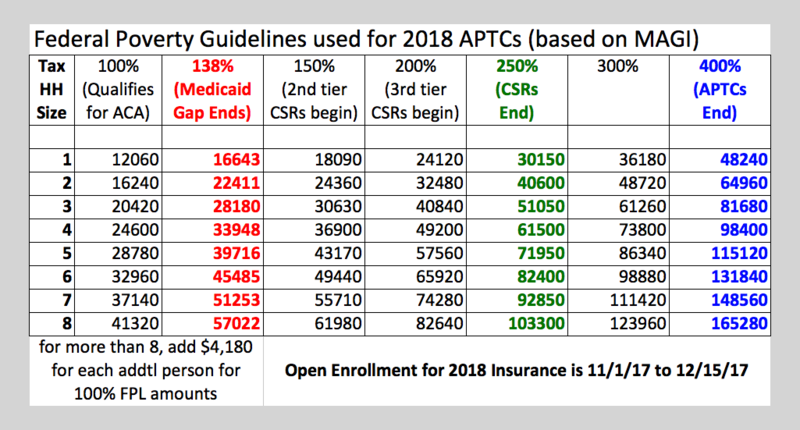 The Bronze will generally be the least expensive as far as monthly premium costs, but will have higher deductibles and out-of-pocket maximums; and may or may not have copays available prior to reaching your deductible. The Platinum will generally be the most expensive as far as monthly premium costs, but will have lower deductibles and out-of-pocket maximums. Between those two extremes are the Silver and Gold plans. If you see that you are eligible for cost sharing reductions, always look at the Silver plans as this is one of the most overlooked cost savings opportunities. The one recurring expense you will always have is the monthly premium that you pay the insurance company. Many people just select the plan with the lowest premium. For many this is a necessity – it’s all that they can afford. For others who are able to stretch their budget to cover higher monthly premium costs, the annual costs for total care may prove to be less expensive in the long run, and/or they usually see a more consistent cost each month of the year. Costs for total care include the monthly premiums along with any out of pocket costs that you pay for health services. The HMO will generally be the least expensive as far as monthly premium costs, but will have a more limited network of providers and will require you to go through a “gateway” primary care physician for referrals to needed specialty services. HMOs generally do not offer out of network coverage, except in an emergency. The PPO will generally be the most expensive as far as monthly premium costs, but will have a more expansive network of providers and will provide you with more flexibility in choosing your own doctor without going through a primary care physician. With a PPO you pay less for service providers that are “in-network” but can access out-of-network care when needed by paying an additional cost – usually in the form of higher deductibles and out-of-pocket maximums. Between those 2 choices is the POS, which allows out-of-network coverage similar to the PPO, but requires referrals to specials similar to the HMO. Remember that your local healthcare navigator is available for in-person help as you make your choices. And you can make an appointment with them anytime throughout the year. Your navigator is available to help you with many things beyond just the initial enrollment process and can answer questions about your health insurance plan before, during and after enrollment. You can make as many appointments as you need to clarify your choices and/or obtain follow-up help with the federal marketplace or your insurance company.